The Jojoba (pronounced ho-HO-ba) plant is a desert shrub native to southern Arizona and California and north-western Mexico. Jojoba Oil is technically not an oil at all but a liquid wax obtained from the bean like seeds in the fruit of the female plant. The seeds are 50% oil by weight. The oily wax is in many ways similar to vegetable oil and, being unusually pure and stable, has an indefinite shelf life. 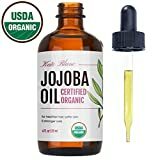 Most other oils are triglecerides but Jojoba belongs to the lipid family and is the only naturally occurring liquid substance in this category. Jojoba is mostly wax esters. In the animal and plant kingdom, wax esters are used for a number of biological purposes, including protection and water proofing. 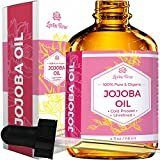 Jojoba Oil also contains Vitamin E, B complex vitamins, the minerals silicon, chromium, copper, and zinc, phospholipids, antioxidants, tocopherols and the fatty acids palmitic, myristic, palmitoleic, stearic, oleic, linoleic, linolenic, arachidic, eicosenoic, behenic, erucic and lignoceric. It is edible but not digestible as it just passes through the intestines unchanged and has no caloric benefit. Jojoba Oil is very soothing for dry, inflamed skin and allergic reactions. As an antimicrobial, it protects skin from infection and the tocopherols help fight the free radicals that cause skin to dehydrate and age. It is antibacterial, anti-inflammatory, hypoallergenic, non-toxic and non-comedogenic. It spreads and absorbs well and a little goes a long way. Jojoba Oil is absorbed so quickly and efficiently by skin that it appears to just disappear but it is because the wax esters of Jojoba Oil are very similar to human sebum. The theory goes that because Jojoba is so familiar to skin, it fools skin into thinking it has sufficient oil, so it balances oil production. In any event, it seems to be good for all skin types, from oily to normal to dry and is particularly useful for combination skins. It reduces the appearance of fine lines and increases the suppleness of skin, acting as a tonic and non-greasy trans-epidermal moisture controller. When massaged into the scalp, Jojoba Oil moisturises the hair and scalp and helps to remove product and dry skin build up plus it prevents dandruff. It can be used neat on wet hair or dry hair as a conditioner. Used under shaving foam, Jojoba softens skin and stops razor burn. Jojoba oil is a valuable ingredient in cosmetics manufacturing due to its oxidative stability. It is used in skin care, make up, hair products, soaps and shower gels. Massage a small amount into the abdomen as needed.